Muskrats extend their feeding areas by constructing “pushups” which are piles of vegetation deposited on the surface of the ice over an opening. Muskrats bring vegetation to these pushups and eat it there. Sometimes mistaken at first glance for the beaver, the muskrat's small size and rat-like tail are the most immediate identification marks. Muskrats weigh from two to four pounds (0.9–1.8 kg). They measure 10–14 inches (26–36 cm) in length, excluding their 8–11 inch (20–28 cm) tails. Their coats consist of soft, dense underfur and long, coarse, shining guard hairs. The guard hairs produce the dominant color of the upper parts. Color ranges from a medium silvery brown to dark brown with a lighter belly. The feet and tail are dark brown or black. Muskrats have both a high reproductive and population turnover rate. Mature females usually have two litters per year and annually give birth to 15 young, or seven to eight per litter. Mating begins as soon as there is open water in the spring. In Interior Alaska this may range from late April to mid-May, and the young resulting from this first mating are born in early to mid-June. Females mate again three to five days after the first litter. Their second litter is born about 25 days later. Thus there are two peaks in breeding activity separated by about 30 days. Evidence indicates that male muskrats remain at the same den with the female for several weeks. The young are weaned at about one month of age, but may stay with the parents for awhile longer. Second litters often overwinter in the same den with their parents. Muskrats reach sexual maturity at about nine to 10 months of age. Muskrats are basically herbivorous. They feed mainly on aquatic plants such as the roots and stems of cattails, lilies, sedges, and grasses. They may occasionally eat mussels, shrimp, and small fish. Vegetation is collected and stored during the summer for winter use. Throughout the winter muskrats remain below the ice for great periods of time eating this stored food and submerged vegetation. They extend their feeding areas by constructing “pushups,” which are piles of vegetation deposited on the surface of the ice over an opening. Muskrats bring vegetation to these pushups and eat it there. These pushups also provide the muskrats with a protected place above water and away from their den where they can breathe and rest. Repeated use usually keeps the pushups free of ice. During winters with little snow and very cold temperatures, pushups commonly freeze solid. As a result, muskrats cannot use them as breathing holes or as locations to eat and rest. This condition can contribute to large overwinter die-offs of muskrats. As the ice thickens during the winter, less area is available for foraging. 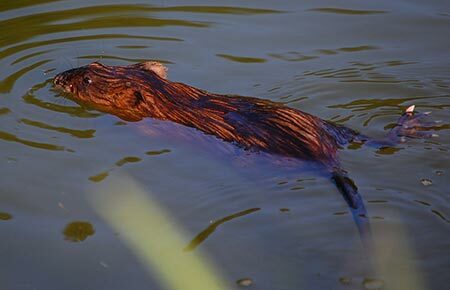 Muskrats are forced to leave shallow ponds to spend their time in deeper ponds to search for food. Deep ponds and channels often have less aquatic vegetation than shallower ones, thus they can support fewer muskrats. Competition for food causes rapid depletion of the available supply. This may result in exhaustion of food supplies and subsequent fighting, starvation, or emigration of the muskrats. There are seldom any unoccupied living spaces available and many emigrants freeze, starve, or are killed by predators. The muskrat (Ondatra zibethicus) occurs throughout most of Alaska's mainland except some islands of Southeast Alaska, the Alaska Peninsula west of Ugashik Lakes, and the Arctic Slope north of the Brooks Range. The highest populations of muskrat are in the broad floodplains and deltas of major rivers and in marshy areas dotted with small lakes. Muskrats are one of Alaska's most visible and numerous furbearers; but harsh winters, dry summers, and overpopulation result in periodic fluctuations in numbers. Four-fifths of the muskrats harvested in Alaska are taken in five areas: the Yukon Flats surrounding Fort Yukon, Minto Flats, Northway-Tetlin Flats, the Yukon Kuskokwim Delta, and the Selawik-Kobuk-Noatak area. In open, swampy areas muskrats construct houses of vegetation piled into mounds two to three feet above the surface of the water and five to six feet in diameter. They also tunnel into earth banks. Their nests are well above high water and have tunnels exiting underwater below the lowest freezing level. Muskrats construct slides and make fairly well-defined channels through vegetation along banks of streams and ponds. During the summer, muskrats may be seen in many roadside ponds and sloughs where there is suitable vegetation as a food source. Often the casual observer will hear a big splash and see something swimming around in the water, giving the impression that the pond is inhabited by large fish which are jumping and surfacing. Indeed, sometimes there are large pike in the grassy sloughs, feeding on an occasional muskrat! If the viewer sits quietly by the edge of the pond or slough, the resident muskrats will soon go about their business, providing hours of entertainment. 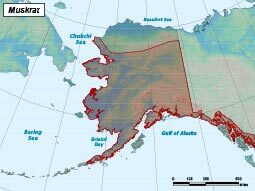 Throughout most of Alaska's mainland except some islands of Southeast Alaska, the Alaska Peninsula west of Ugashik Lakes, and the Arctic Slope north of the Brooks Range. Herbivorous. Eats mainly aquatic plants such as the roots and stems of cattails, lilies, sedges, and grasses, occasionally some animal life such as mussels, shrimp, and small fish. Breed twice per year. Females give birth to litters of 7–8 young.